Isla del Sol/Bolivia, 1962. During a research trip the linguist J. C. Duenkel makes the groundbreaking discovery of a language thought to be long dead. Fascinated by its peculiarly coarse sound, the researcher begins to make recordings of the forgotten idiom. Chan Chan/Peru, 1968. Duenkel takes part in archaeological excavations in the hope of finding correspondences between words and matter. June 1969. Peru’s military government implements a radical land reform. Duenkel and a group of friends and colleagues move to a deserted area in the middle of Chan Chan. 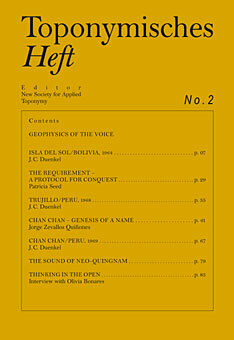 The second toponymic journal is dedicated to the voice and its relation to space. 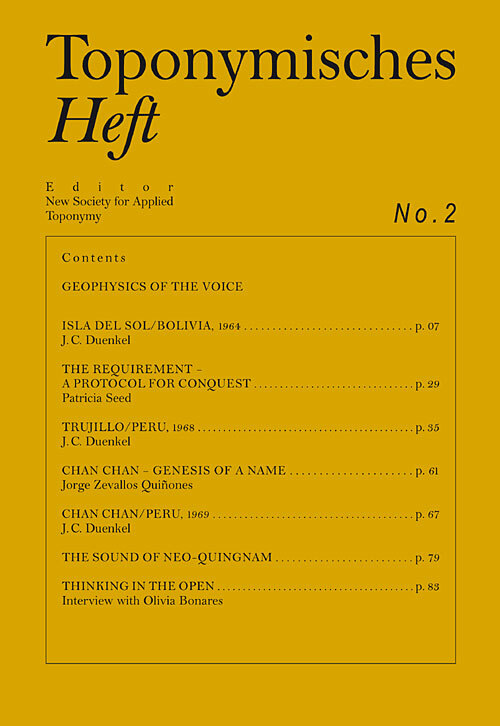 At the center of the journal are the researcher J. C. Duenkel’s notebooks – published here for the first time – and his praxis of geophysical speech acts. In addition, selected essays examine the historical dimension of expansionist rhetoric, of loss of language and name.